Voles, also known as meadow mice, are a species of ground-dwelling rodent that tunnels through the earth. They have compact bodies measuring 5 to 8 inches long, including a shortly furred tail. 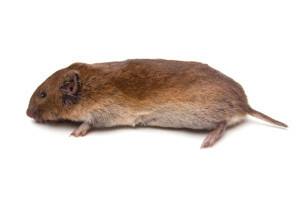 A vole’s fur is coarse, varying from blackish to grayish brown in color. They also have short legs, partially hidden ears and small eyes in keeping with their subterranean lifestyle. Although voles spend a majority of their time below ground in burrow systems, you can occasionally catch sight of them above ground, scurrying along well-traveled runways. These runways connect burrow openings, which measure about 1-1 ½ inches in diameter. Each burrow system is occupied by several adults and their young. The size of a burrow system, including its related foraging area, depends on population level, food supply, and habitat quality, and is typically a few hundred square feet. Unlike moles, voles feed primarily on plants, and their activity has often been mistakenly attributed to their more carnivorous cousins. When it comes to voles, no tree, shrub, flower, vegetable, or even weed is safe. Voles are an absolute nightmare for your garden, especially since they eat approximately their own body weight each day. In addition to feeding on plants, voles also gnaw the bark of trees. Damage done to tree trunks normally occurs a few inches above or below the soil line. Gnaw marks are about 1/8 inch wide and 3/8 inch long. When voles gnaw completely around a tree trunk, the tree’s flow of water and nutrients is disrupted, a process known as girdling. Depending on the severity, this type of damage can kill the tree in question. Even partial girdling can result in reduced yield of fruit trees, yellowish /anemic looking leaves, and overall poor vigor. Aside from the ecological destruction they inflict on gardens, voles can also create unsightly traces of tunneling on surface soil. Despite the fact that they are also known as meadow mice, eliminating a vole problem is different than dealing with a mouse issue. Due to their poor climbing ability, voles are rarely seen entering homes or businesses. Consequently, baiting stations are typically used in exterior locations, placed in close proximity to voles’ pathways.